Born from one man’s vision to produce the most complete luxury performance boats on the market. Hunton boasts a pedigree second to none: a racing heritage spanning more than three decades, with countless championship wins and a glittering trophy cabinet. 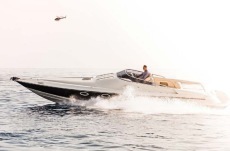 Hunton is the brand for those that know and appreciate high performance, luxurious powerboats. A true Grand Tourer on the water. Whatever the conditions, the RS43 will ensure that you arrive at your destination in comfort and with a great sense of satisfaction. 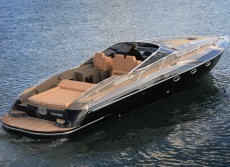 She has levels of refinement and luxury rarely seen on powerboats of this size and its ingenious aft cabin a huge bonus. No other boat quite combines such exhilaration and sea-worthiness with top quality accommodation and practical touches. With the RS43 you have arrived, in style. OUTSTANDING PERFORMANCE, ULTIMATE LUXURY Timeless elegance, exquisite finishes and seductive power: the XRS43 is the ultimate combination of performance and luxury. Every feature on an XRS43 is truly Hunton – from the clean lines and race-inspired stepped hull to the hidden technology that delivers its superb handling. Powerful, yet supremely luxurious, driving the XRS43 presents a thrilling blend of speed, exhilaration and fun. The XRS43 offers good head height, a spacious salon, separate heads and shower, a well-appointed galley and a double berth, with teak decking, leather upholstery and bespoke design finishes as standard.